It is estimated that allergies are the sixth leading cause of chronic illness in the United States, and their prevalence is on the rise in other parts of the world as well. The allergens, which are the substances that trigger allergic reactions, exist everywhere and in hundreds of varieties. Women of all ages suffer from allergies, desperately searching for effective treatments and relief. Read on to learn more about the most common allergies, their symptoms, and the available solutions to manage them. Most of food allergies are caused by the substances found in the following eight foods: peanuts, milk, shellfish, soy, wheat, tree nuts, and fish. Pollen allergy. The most common trigger of seasonal allergies, pollen is released by the plants, such as trees, weeds, and grasses at various times throughout the year. Pet allergy. The allergens triggering an allergic reaction are found in urine, dander, and saliva of cats, dogs, and other household pets. Mold allergy. Allergic reactions are triggered by an inhalation of mold spores, which are tiny fungi found in bathrooms, carpets, and other places that are warm, dark, and moist. Dust mite allergy. These small arthropods are found in all homes, in carpets and bedding, and are hard to be eliminated. They are very serious and most commonly include allergies to penicillin, sulfates found in processed foods, or salicylates found in non-steroidal anti-inflammatory drugs (NSAIDs), such as aspirin or ibuprofen. Although relatively rare, insect venom allergies often lead to serious complications, such as an anaphylaxis. They are caused by five insects: honeybees, hornets, wasps, fire ants, and yellow jackets. It is the quickest and most effective way to lower the risk of having an allergic reaction. Food allergens should be avoided by all means, because even a small amount can lead to serious complications. There are ways to allergy-proof your house by keeping it clean and vacuumed frequently by shutting the doors and windows to avoid pollen from getting inside, and by using appliances with HEPA filter to purify the air. Natural methods found helpful in relieving allergy symptoms include steam inhalations with essential oils, such as eucalyptus, saline sprays for nasal irrigation, and supplements with herbs, like butterbur. Acupuncture has also been shown to alleviate allergy symptoms. 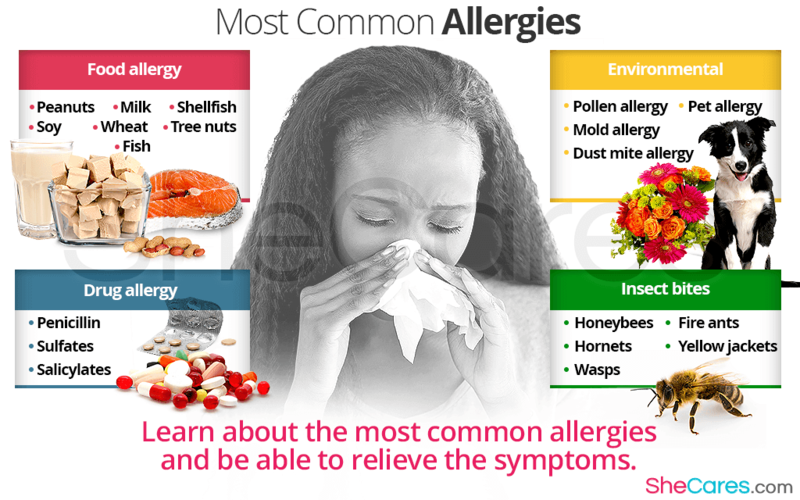 Allergy symptoms can be suppressed with anti-histamines and decongestants, many of which are available without prescription. Some allergy medications can have unwanted side effects, such as drowsiness or palpitations. Another option is immunotherapy. It consists of a series of injections containing the allergens, and it is designed to allow your body become immune to it and prevent allergic reactions. Most allergies negatively affect women's quality of life and often require some significant lifestyle changes, so read more about natural ways to relieve allergies.